Vitamin C is also known as ascorbic acid and is a water-soluble, antioxidant vitamin that plays a role in more than 300 bodily functions. It is essential to help support health and wellness and requires daily replenishment. Unfortunately, human beings—unlike other animals—cannot manufacture vitamin C. Nor can they store vitamin C to any appreciable amount. Instead, the kidneys, acting as regulators, excrete vitamin C causing the need for regular replenishment. In addition, vitamin C is destroyed during food preparation. Vitamin C is essential in helping to maintain collagen, a protein necessary for forming skin, ligaments, bones, and teeth and for helping to maintain the strength of blood vessel walls. 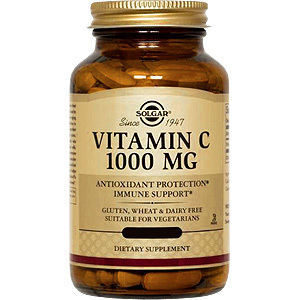 High levels of vitamin C are also essential for the metabolism of white blood cells, which are critical components of the immune system. In addition, vitamin C plays and important role in the absorption of iron, which is necessary for the formation of red blood cells and in the utilizationi of folic acid, one of the B-complex vitamins. Solgar's Vitamin C with Rose Hips Tablets are free of corn, yeast, wheat, soy and dairy products and are formulated without the use of preservatives, artificial flavors or colors. DO NOT USE IF OUTTER BOTTLE SEAL IS MISSING, TORN OR DAMAGED IN ANY WAY. Other Ingredients: Microcrystalline Cellulose, Vegetable Cellulose, Silica, Vegetable Magnesium Stearate, Vegetable Glycerin, Carnauba Wax. 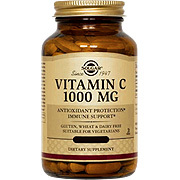 Vitamin C 1000 mg with Rose Hips is shipped in a discrete, unmarked package. Orders are processed immediately and usually take about 3 to 5 working days to be received. We do ask that you try it for 2 to 3 weeks to feel the full effects. Any information received is used only for order processing and shipping purposes. Your information, such as e-mail address, will never be disclosed to a third party.